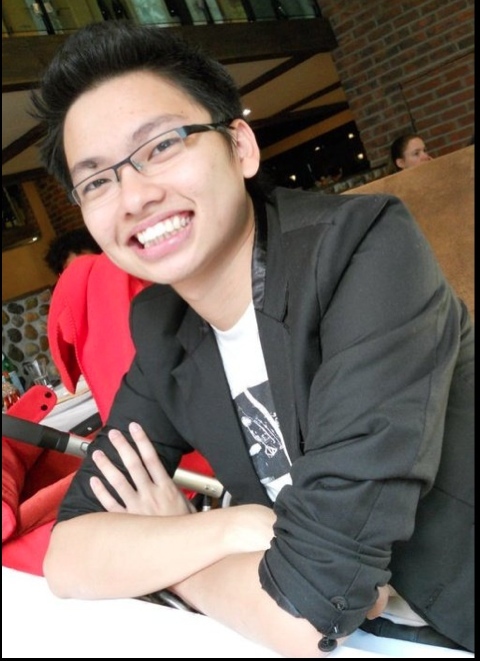 Hi, I am Jacky Yap. As on 2018, Jacky is currently the managing director of GRVTY Media, the digital media company behind Vulcan Post, Discover SG, Millennials of Singapore, with regional offices in Malaysia and Philippines. This publication will be a space where he shares his experience in the personal finance space, as well as thoughts on the digital media and tech startup space. 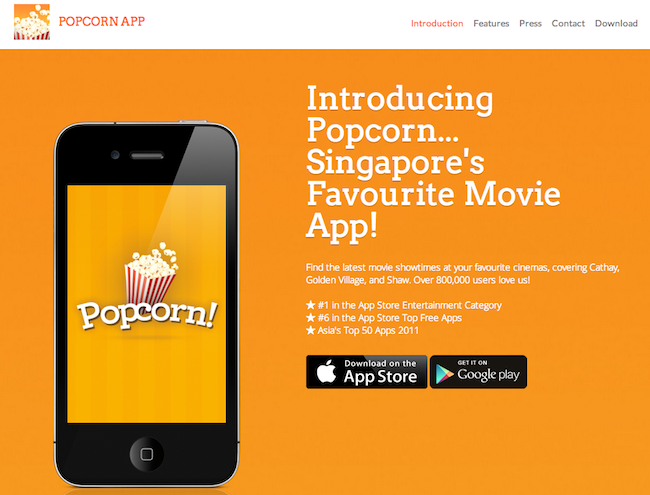 I am currently doing business development at Popcorn, the top cinema showtimes movie app in Singapore. To date, the app has been downloaded over 850,000 times in Singapore. My role in the company? Business development + Sales + PR + Fund raising. What’s so cool about the company? We have about 850,000 total downloads to date, something which attracted me to the company in the first place. And nobody is disrupting the movie/cinema industry in Singapore. How big is the team? I work alongside the CEO and the CTO. I’m the first hire. Where’s the office? Orchard road. So hit me up for coffee if you are around the area. How’s work so far? Stressful and exciting. While I have been writing all these while, it feels good to be in the game in the real world, making things happen. So what have I done during my first month at Popcorn? 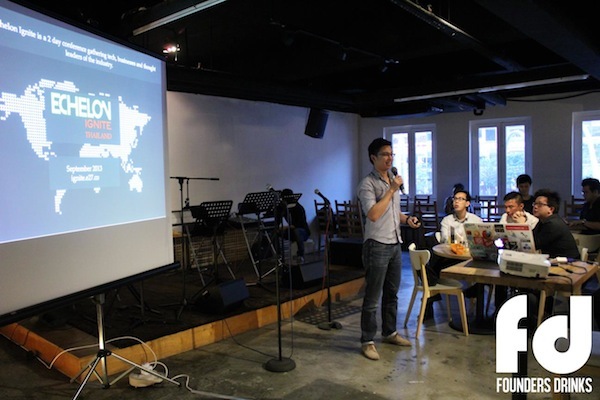 Vulcan Print is an ebook teaching first time entrepreneurs how to reach out to journalists in Southeast Asia. Often times I get questions from new startups on how they should go about pitching to journalists. So I decided that I should turn it into an ebook. I have always wanted to publish a book, and now I’ve got that checked off my list. Actionable tips you can start applying to get the attention of top tier tech media outlets in Southeast Asia. One stop guide on how to pitch your businesses to journalist. Case studies of two companies who have done an exceptionally good job in their PR. Learn how to write a compelling email pitch and press release with professional standards. Bonus: Curated frequently asked questions from Quora including questions such as: How do journalists find their stories and Can you send a “Thank You” gift to a journalist? The ebook comes at $4.99. I started the project early August where I worked on it every night. ebook was done in a month, and launched in mid October. I am currently the senior writer at e27, one of the main tech blog covering technology and startup news around Asia. e27 runs one of Asia’s leading technology conference called Echelon, and is backed by B Dash Ventures (Japan), Ardent Capital (Thailand), Pinehurst Advisory (Taiwan), Dan Neary (Singapore), and 8Capita (Singapore). Update 15th September: I am no longer full time with e27, and is currently a contributing writer there. My editorial schedule remains the same, and I will continue to write about great companies and products, as well as penning down my thoughts on the startup ecosystem. I joined the company back in August 2011. In 2012, I wrote a total of 472 posts for e27, generating about 32% of e27’s 2012 total page views. The total page views of e27 in 2012 also grew more than 200% since 2011. 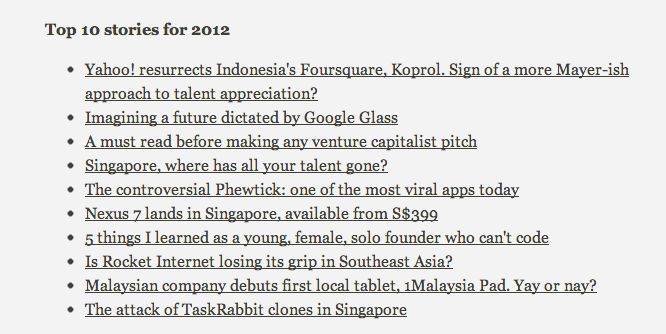 On top of that, 8 of 10 of e27’s 2012 most read articles were written by me, with the other two authored by guest writers. I cover startup news around Asia, particularly, Singapore, Australia, Taiwan, Thailand, and Malaysia. Dave McClure, founding partner of 500 Startups also dropped a comment on an article I wrote for e27, showing his nod of approval on some of the facts I wrote about FoodSpotting’s exit. 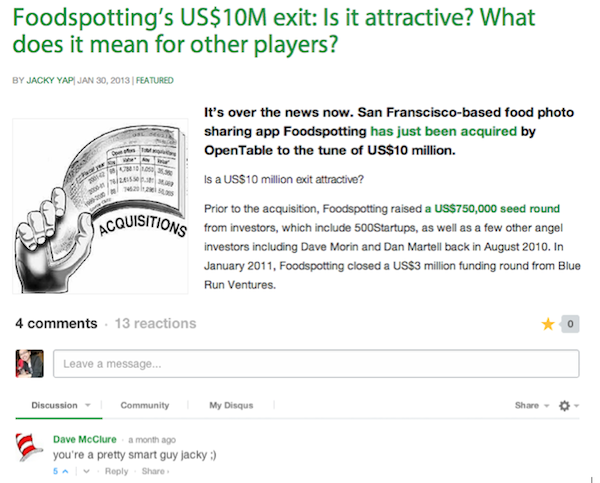 Read the full post here: Foodspotting’s US$10M exit: Is it attractive? What does it mean for other players? Video sharing apps: Goldmine or sinkhole? foodpanda announces new partnership, but are they really the leader? Single handedly pitched and secured the partnership of more than 30 partners, including Facebook, Shutterstock, Zendesk, 99designs, Freelancer, Airbnb, WP Engine, Vsee, Zendesk, Microsoft Bizsparks, as well as coworking spaces around in Southeast Asia. Launched the product exactly 2 months since the initial idea inception. See live website here and version 1.0 here. January 2013: January Founders Drinks: Revisiting 2012, Exploring 2013 [content curation, securing panel of speakers, publicity of event, worked with sponsors] – Sold out, 120 attendees. 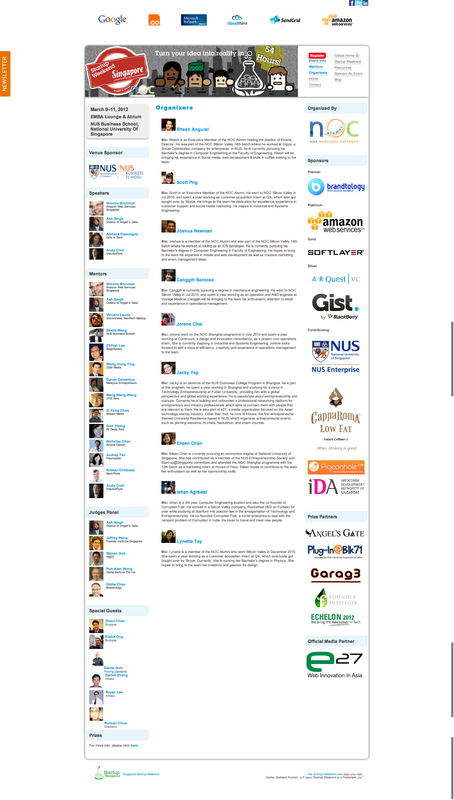 April 2013: 21 growth hacking tips [content curation, securing speaker, emcee, publicity of event] – Sold out, 85 attendees. Generated event revenue. June 2013: Raising $1M from Kickstarter in 1 month [content curation, securing speaker, emcee, publicity of event] – Sold out, 84 attendees. Generated event revenue. July 2013: Growing your app to more than 800K users [content Curation, securing speaker, emcee, publicity of event] – Sold out, 77 attendees. Generated event revenue. 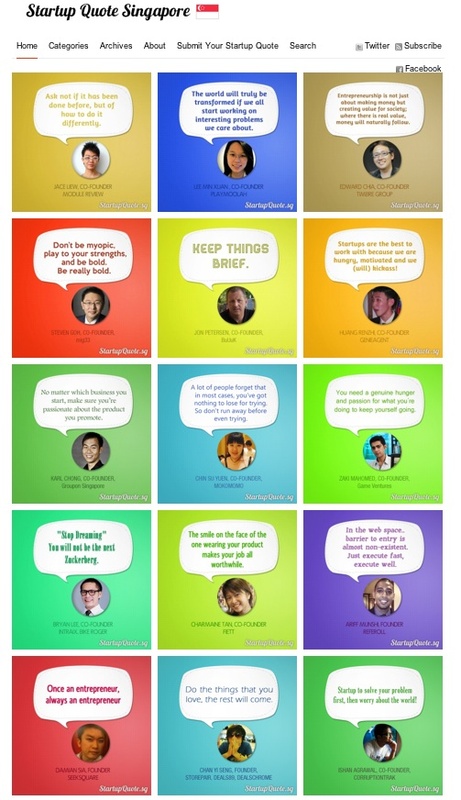 Startupquote.sg (closed down due to difficulty in scaling and it was only a side project). See screenshot here. Startup Weekend Singapore 2012 (was the coorganizer of a 140 pax Startup Weekend. I was in charge of mentor relations, media relations, some logistics. The paid event was oversubscribed, huge success, and spawned off Singapore based Carousell.) See screenshot here. N-House (I was the pioneer resident assistant, tasked to lead 100 residents during their stay in Singapore’s first entrepreneurial themed dorm. I pioneered the weekly Wicked Wednesday session where we invited speakers to come and speak to the residents of N-House. N-House was featured on Bloomberg too). Judged at Start-Up Dynamo, a lean startup and growth hacking workshop by Start-up at Singapore, Singapore’s largest business case competition. You can also find me on Twitter, Facebook and LinkedIn. Hey, Jacky i am the one of your group member which engaged in Business model class(First semester, 2012) As you might remember or not, i am interested in lunch “lunchsparks” in the Korea. But it is not allowed to get in Lunchsparks main sites ( http://www.lunchsparks.me- what we made and PT same times)So, If you check this, plz contact me ASAP! want to see you soon ! I found your website after noticing you pinged an article from my blog. Well, it’s really awesome to discover you and your website as I’m currently on the look out for people with startup know hows in Singapore. I may know how to explore and take off like a wind to travel the world but am clueless in the world of startups. I’d like to eventually start a social enterprise. If you’re willing to give me some thoughts or tips, I’ll be delighted to hear them. Cheers!